There are a few different blog series I want to start, with the first being Thursday Thoughts. Content will range from recently read articles to new destinations. The main purpose of these is to get YOU to share your thoughts. We all have stories and feedback that can benefit someone else + I would love to hear from you! In February and March I traveled to Morocco, Spain (Barcelona), Canary Islands, Italy (Milan) and Massachusetts (Boston). There will be lots of posts coming on those incredible adventures, but for now I’m excited to announce the next trip. In two weeks I will be exploring Europe with one of my best friends, Holly! Normally I travel solo or use a local company that offers private or small group tours. This time we are doing a Contiki tour, with a few free days before and after. Hopefully the group won’t be too large, but I’m optimistic we’ll meet some amazing new friends and have a blast. So, where to? 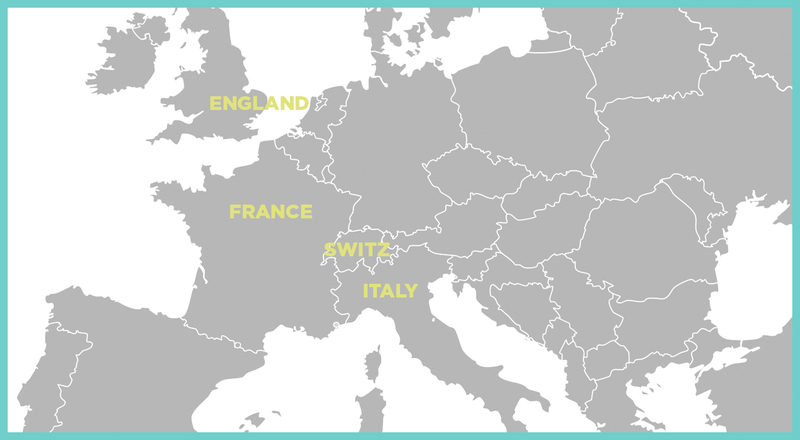 Italy (Rome & Florence), Switzerland (Swiss Alps), France (Paris) and England (London). While there are some activities scheduled through Contiki there is also free time and we want to be sure to make the most of it. For the free days in Paris and London we have already purchased (1) Skip the Line Eiffel Tower Tour with summit access, (2) Skip the Line entry on the London Eye, (3) Warner Bros. Studio Tour (The Making of Harry Potter). What are must do things? Any advice/suggestions? Have you been on a Contiki tour? Maybe you’re in love with one of these cities in particular. I’m open, share away! Thank you in advance. London is so much fun! Great art, shopping, and sights. My Taste & See Life tips for London include: see a musical (I loved Wicked! ), eat fish and chips at a local pub, have high tea at Claridge’s, and do a little shopping at Harrods, Marks & Spencer or Selfridges. Have fun and I can’t wait to see your post when you return! My favourite thing to do in Rome was to walk the Via Appia Antica however it isn’t a touristy thing to do! One place I have never been is Villa Borghese but that might be really worthwhile. Tips for Rome would be go to St Peter’s really early to avoid the crowds, and zip up well if you take the metro! Trains are okay in Rome. For example a line B ride out to Ostia Antica would be a great adventure. I love wondering around Trastevere, I love Frascati (another train ride), I love Rome! If I was in London I would hotfoot-it out to Cambridge! In Paris I know you’ll enjoy plenty of macarons. I have only just driven through Switzerland, but good luck with that! Switzer-Deutch is great to listen to. Great suggestions Chris!! We’ll see how much we can fit in. Thank you for sharing. Caleb, thank you for reaching out on Instagram and on here. I appreciate the tips, and will definitely have to try the Luxemburgerli! One of the other tours we looked at went to Interlaken instead, so I’m glad you think Lauterbrunnen is amazing. Can’t wait to be there! I see you have already been in Barcelona, so you have a taste of how great European countries are. That’s great. I visited a great deal in Europe (in fact I grew up there), so I think you’ll love it there. Luzern and the Swiss Alps are a great choice. Yes, Barcelona and Milan were my first taste of Europe in March. Thank you for sharing your blog post on Luzern, looks stunning! This trip will be a great mix, but I think I’m most excited about Switzerland. Europe is a huge buffet with never enough time or room, aka $, to taste it all so enjoy the little nibbles you will have on this trip. Make notes of where to stay, what to see, experience and discover in depth next time. This is a great sampling of the geography, cuisine, sights, history and cultural treasures of the world. Looking forward to your pictures, blog and reflections when you return! Bon Voyage! Definitely! This will be a great sampling trip to see a variety of famous cities, attractions and landscapes. Thank you, my awesome travel agent, for all your help planning. There will be lots of pictures and posts coming (and I still need to do posts from our month long trip earlier this year)! Hmmm… Jana it never showed anything from you on this post (only comment I saw was on the first travel conferences post). Sorry! Repost your comment? What a fun adventure awaits you! Switzerland is the most beautiful country, just step outside and you’re good. And the chocolate is delish! I always love the parks and shopping in Paris–Place du Vosges, Luxembourg, the Tuileries are memorable parks, while macarons at Laduree, banana and nutella crepes anywhere, and falafel and shopping in Le Marais are wonderful places to relax when not at top cultural destinations! And London shopping can’t be beat for me. I always end up at Harrod’s and Marks & Spencer on Oxford St. Recently I had a lot of fun shopping for fancy teas and chocolates at Fortnum & Mason solely because they had the most beautiful packaging ever! I am looking forward to seeing your future posts!! Thanks for the suggestions Carrie! This trip I will definitely get my fill of desserts between chocolate, gelato, macarons and crepes. I’m excited you said that, we made a reservation at Fortnum & Mason our last full day for afternoon tea… and I’m all about package design! Thinking some gifts will be coming home with me from there.